Low Resistance meters e.g. Micro Ohm Meter, Milli Ohm Meter work with the principle of 4 wire measurement. Two terminals provide test current and two terminals are used for sensing voltage drop. 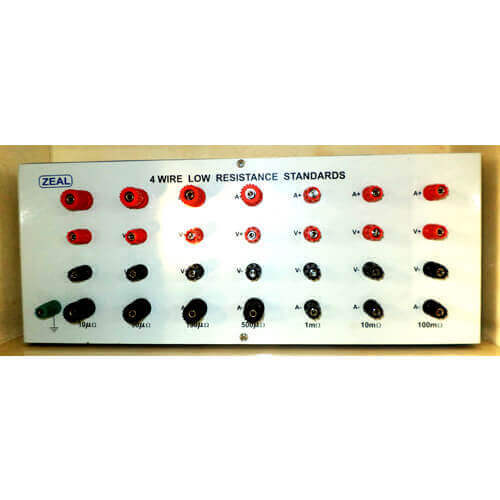 ZEAL make, 4 Wire Low Resistance Standard serves the purpose of accuracy and economy. The resistance values are very stable over years. Low resistors of values of 10µΩ,50µΩ, 100µΩ, 1mΩ, 10mΩ, 100mΩ, 1Ω have been fitted in an enclosure with provision for each resistor’s current terminals and sense terminals.